Protesters shouting slogans for migrant workers' rights outside an employment agency in Hong Kong last year. One in three households with children in Hong Kong employs a foreign domestic worker, who works an average of over 70 hours a week. The Straits Times, "'One in 6 HK foreign maids in forced labour'," March 16, 2016. Eni Lestari is a migrants’ rights activist and the Chairperson of the Hong Kong-based International Migrants Alliance (IMA), a global alliance of grassroots migrants, immigrants, refugees, and displaced people. She is also a former domestic worker who ran away from her employer in 1999 after experiencing the labor abuse so rampant against migrant workers. Lestari has been heavily involved in organizing Indonesian migrant workers in groups like the Association of Indonesian Migrant Workers, Indonesian Migrant Muslim Alliance, and United Indonesians Against Overcharging (UIAO). More recently, her political work has brought her to the international stage: since being elected as Chairperson of the IMA, Lestari presented on global migrant issues at the United Nations’ first-ever summit on refugees and migrants in 2016 and has been involved in other international migrant advocacy organizations, such as Asia Pacific Forum on Women, Law, and Development. Promise Li is a PhD student in English at Princeton University. He is a former tenant organizer in Los Angeles Chinatown and served as regional organizer for the U.S.-based socialist organization Solidarity. The precarious state of migrant workers has become a major area of concern for the contemporary global economy. In Southeast Asian regions in particular, the number of migrant workers has spiked since the 1990s. In the city of Hong Kong, domestic migrant workers, predominantly Filipino and Indonesian women, now make up around a tenth of the total working population. 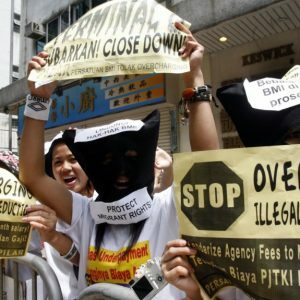 Since the beginning of Southeast Asia’s labor diaspora, activists have been fiercely organizing against the rampant exploitation and abuse of migrant workers. Promise Li: What was different about the issues facing migrant workers in the 1990s, when you first came to Hong Kong, compared to those they face now? How do you feel your approach to organizing has changed over the years? What are some examples of successful campaigns in Hong Kong led by migrant workers in recent years? Eni Lestari: Migrant domestic workers, beginning with Filipino, Thai, Indian, and Nepali domestic workers, have been in the city of Hong Kong since the 1970s. Indonesians were actually latecomers, only arriving in the late ’80s and growing after the mid–’90s. I came here in the late ’90s and ran away from my employer in 1999. When I ran away, I began to understand the broader reality of migrant domestic workers. A common problem at the time, especially among Indonesian workers, was that we were underpaid—we received something like half of the minimum wage. For example, I was supposed to be paid around HK$3,600 a month, but actually received only about HK$1,800. Employers would make excuses for this, saying that it was because we don’t speak English, or were new, or any other reason. But in our survey, we found that almost 80 percent of Indonesians were underpaid at the time. Another major issue for workers of all nationalities was that agencies overcharged us for fees. Many Indonesian workers even had their passports confiscated by their agencies. Agencies also denied us rest days. Most contracts grant workers Sundays off every week, but, in practice, most Indonesians were only allowed one day off per month—as was the case with me. At most, workers would maybe get two days off a month, but many others didn’t even get one day off. The routine violation of employment contracts was a huge problem. For example, agencies would assign workers illegal extra work; they would make us work in different houses, shops, and restaurants. Employers would make these types of arrangements, using domestic workers to do more work, in order to save money. This is all part of the bigger context of the time. When I first came to Hong Kong, Filipinos were the most organized. Thais and Nepalis were somewhat organized, but their numbers were small even at the time. But these groups were all participating in a political organization called the Asia Migrant Coordinating Body (AMCB). When I helped form the Association of Indonesian Migrant Workers, we immediately joined and became very active in AMCB because it was the city’s oldest and biggest alliance of this sort. It was formed in 1994 for cultural exchange purposes, but was later politicized when the Hong Kong government began introducing policies to cut wages, including increasing taxes and taking away maternity benefits—in other words, ramping up efforts to eviscerate domestic workers’ rights and benefits. Under these conditions, from 1998 to 2003, AMCB was forced to become increasingly political and became very active in confronting the government’s austerity proposals. I focused mostly on organizing Indonesians, who eventually became the second biggest migrant-worker population after Filipinos. When I came to Hong Kong, I believe the number of Indonesians was less than 50 thousand; now, we are at 150 thousand and are growing by the tens of thousands each year. This is because the Indonesian government is keen to deploy more Indonesian workers to places like Hong Kong. In the early 2000s, our main focus was to combat underpayment, denial of rest days, and agencies’ overcharging. From Causeway Bay to Kowloon and Yuen Long, we organized a lot of public education programs and mobile counseling services. We also began establishing networks with different institutions, like churches and mosques, so we could make sure to provide resources and shelter for Indonesian migrants who ran away from employers. After long years of education and awareness raising, I can at least say that, after 2007, the issues of underpayment and denial of rest days are improving. Fewer workers are being underpaid now, most Indonesians enjoy Sundays off, and most workers do not have their passports taken away. Of course, there are still loopholes that agencies exploit. For example, most newcomers still don’t have their passports and on Sundays, which are usually rest days, some employers only allow workers to leave the house after nine o’clock in the morning and make them come home by around six or seven o’clock in the evening so they can do household work. These are just some of the areas we became more aggressive about in terms of organizing and public education. Around and after 2007, fighting against agencies overcharging workers for fees became a huge campaign. Overcharging, also known as an agency fee, remained fairly hidden. Whenever we would try to report the issue, the government claimed that the agency was responsible, so nothing could be done about it. It took us a while to review different policies and understand the root causes of the issue, especially the role played by the Indonesian government. Aided by internal corruption, the Indonesian government would issue policies without informing the public. Eventually, we obtained the documents necessary to engage with the national government in Jakarta. Among Indonesian migrants, it took us a while to generalize the understanding that overcharging is a crime and a violation of workers’ rights. While the Hong Kong government claimed it was illegal for agencies to collect fees from workers that amount to more than 10 percent of their monthly salary, in reality, agencies were collecting a lot more than that. One tactic they employed was not writing receipts for the fees collected from migrant workers, as well as keeping workers’ passports and using the Indonesian government to collect the money. In Indonesia, overcharging is legal up to the amount of HK$7,000 even though many agencies charge more than HK$20,000. However, the Indonesian government does not have any process in place to handle workers’ grievances. Thus, for a long time, agency fees were agreed on by the government and private agencies. Migrant workers had no role in these discussions; they were simply known as the so-called beneficiaries of the policies. Of course, we were subjected to pay whatever the government and the agencies decided, which was never to our benefit. It took us a long time to discover these agreements between the governments and the private agencies. In 2007, we were able to uncover the agreements and publish our findings. We came out with our own statements and positions. In this context, United Indonesians Against Overcharging (UIAO) was formed and I became its chairperson. UIAO brought together twenty-five Indonesian groups in Hong Kong and we became very active in the public-education campaign against overcharging. Since then, we have been able to reform the law, which now covers most of our demands and was passed in 2017. This new law recognizes overcharging as a criminal offense, as well as migrant workers’ right to unionize and claim compensation. 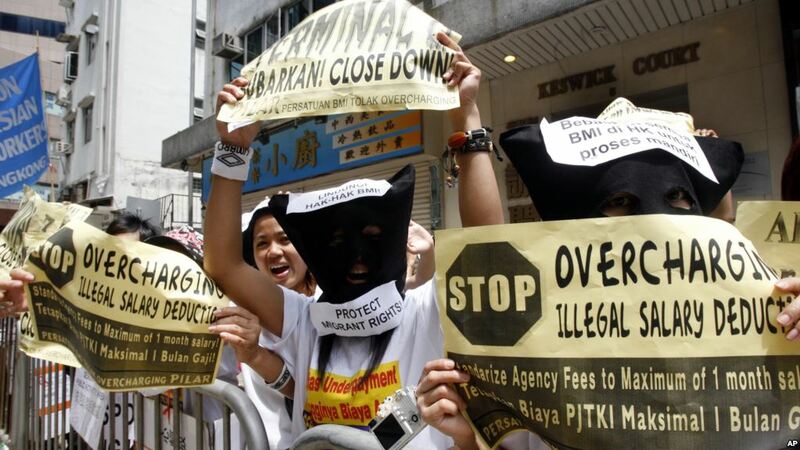 These have been our demands since 2007, when we realized that both the Hong Kong and Indonesian governments were using the law to legitimize the practice of extracting as much money as they could from migrants and legalizing private agencies to deploy and exploit this whole group of vulnerable workers. It took decades to reform this law because of the conflicts not only between us and the Hong Kong government and agencies, but also between the government and the agencies themselves. Needless to say, a major obstacle was reaching an agreement on who is responsible for migrant rights. In practice, agencies have long been the sole authority in coordinating migrants’ labor processes, from recruitment to deployment. Now that the government is strengthening labor regulations and undercutting agencies’ authority, the agencies are complaining about the government. But through our campaign, the voice of migrants grew stronger and we were able to pressure all parties to agree to most of our demands. PL: It is incredible to see migrant groups work together to fight for their rights and better working conditions. How did different nationalities unite to organize larger campaigns while navigating cultural and political differences? What were some of the challenges of trying to connect migrant struggles to larger, structural questions of neoliberalism, globalization, and imperialism? EL: We really have to study the specific situation of migrant workers in Hong Kong and how they organize. What united us was that we were all domestic workers. Domestic work is by far the biggest sector for migrant workers in Hong Kong and everyone, for the most part, is under the same regime, rules, and arrangements. That’s what unified all these different nationalities into one campaign. Although there are migrants who work in other sectors, like the entertainment, construction, and service industries, they have been harder to reach since their working and living conditions differ. Unlike the overwhelming majority of domestic workers, most migrant workers in other industries enjoy permanent resident status in Hong Kong. Domestic workers receive minimal to no benefits and most of us do not have the legal rights to stay at or change our jobs. As such, there is no point in each nationality organizing rallies and campaigns on their own. If only one nationality demands something, they are probably going to be ignored by the government. But by uniting all the nationalities into one campaign, it is more difficult for migrants to be ignored. Of course, we need to always make sure that we are not divided by the government and agencies. They have tried to pit us against each other. For example, agencies and the government would tell us that Filipinos want all the jobs for themselves and are hoping Indonesians complain so that we lose ours. It is extremely important to recognize our rights as workers and to make sure we are not divided. As for our own governments, it is mainly the responsibility of each nationality. Filipinos and Indonesians are generally very active in campaigning against their own governments regarding various issues. They lobby, picket, rally, and so on. Workers of other nationalities, like Thai and Nepali workers, tend to take less action against their own governments. Importantly, we always invite workers of other nationalities to join these actions against our own regimes. There is a principle of building a united front against the Hong Kong government and there is also a mutual understanding that we support the campaigns of workers from different countries than our own. This is our way of maintaining unity while respecting each other’s cultural differences and campaigns. Waging the campaign against neoliberalism, globalization, and imperialism is one of the bigger challenges in Hong Kong. Much of Hong Kong’s political movement does not recognize globalization as a major issue. While political groups would often organize against symptoms of capitalist exploitation, the deeper structural issues of globalization and imperialism are not talked about as much. Many groups understand their fights against the Hong Kong government as independent issues, so it is difficult for our movement to campaign, even among migrants, against neoliberal globalization. Even though we have been addressing these issues in our educational campaigns, the entry point is still a little tough for people. Migrants are far away from their homeland so while they may not directly see the effects of globalization, they definitely feel them. They still have to send money back to their families and some of them are unable to return home for ten or twenty years. With social media, it is now easier for migrants to keep up with what is going on in their home countries, but it was not so easy in the past. When we say we are victims of poverty and displacement, they agree, but when we say we are victims of neoliberal exploitation, most still don’t get it. Workers in industries like mining or construction can immediately relate to how capitalist globalization has exploited their land. But migrants have been away for a long time. Often, their only connection to their homeland is family, to whom they still have to send money, so sometimes these larger struggles do not seem urgent. In Hong Kong, the liberal economy still provides migrants the benefit of an income, so most often do not see their exploitation until they do not get paid. The key is to connect these individual instances to systemic exploitation, so we see one of the crucial roles of our organizations is to continue educating migrants about these larger systemic issues. The quick turnover with migrants makes these campaigns difficult, but, of course, they always come back. PL: Organizing against larger systems of oppression is definitely difficult, especially for migrant workers whose jobs have left them with little free time and minimal labor protections. What does a typical week look like for migrants and what are some ways that workers organize despite their busy schedules? EL: That is really the challenge of our organizing. Since we mainly organize live-in domestic workers, the only free time they really have is Sundays and major holidays. Aside from those times, we primarily communicate through the phone. Their free time on weekdays is before noon, in the afternoon before they cook dinner, and after ten o’clock at night. We would sometimes use these times to check up on them or hold phone meetings with larger groups. Sundays are our prime time to organize and educate workers and discuss our campaigns, while also helping to facilitate social activities and cultural events. Sundays are always full, from ten o’clock in the morning to six o’clock in the evening. Sometimes we hold meetings early on Sunday mornings, but some workers are only allowed to leave the house after nine or ten in the morning. Between one and four o’clock in the afternoon, we host cultural and social activities, English language courses, dance practice, political education, rallies, and the like. During weekdays, we mainly use social media and messaging platforms like WiiChat and WhatsApp to disseminate information and organize. In the past, we have had some trouble with social media becoming unhealthy, negative spaces. Since 2014, we have made it a point to teach people to raise and deal with problems formally, respectfully, and while maintaining organizational discipline. PL: You mentioned that a majority of Hong Kong’s migrant workers are women and that the emotional toll of their labor conditions can be immense. Can you elaborate further on some ways that migrant workers find ways to maintain group solidarity among and provide support for one another? EL: Migrants will naturally come together and support each other. They have no family in Hong Kong and many groups take part in political and cultural activities together, from observing religious holidays to raising funds for things that are needed back in their home countries, such as orphanages. There is a lot of sympathy among migrants and many will do anything to help their communities back home. They know what poverty feels like. These groups go beyond merely doing activities: they provide emotional support for migrant workers. Many workers need to talk about their family issues. They need a group just to listen or, at times, support them financially. For most, being part of these groups is a necessity. You see these groups everywhere in the city; on their days off, migrants do everything in groups. And it is in the context of these already self-organized groups that we organize political activities. Like I said earlier, we use the issues they face as migrants to help them understand the larger system of exploitation. For example, one of our biggest educational programs is know-your-rights legal counseling for migrants to be able to identify and tackle common labor-rights violations, such as wage theft, employer abuse, and overcharging. We train our members to know their rights as workers and, whether or not they will use this knowledge themselves, this program becomes a key part of our organizations’ formal education. We also train members so they feel empowered to help other migrant workers beyond the framework of just legal rights. To this end, we created a peer system so that migrants can help each other with different skills, especially for those who can provide stress relief, massages, psychological counseling, and other similar resources. Our organizing is very active on Sundays because we don’t just rely on a few people—everyone contributes. In June, we just had our Muslim New Year and UIAO invited different groups of migrants to continue building connections, discussing the issues of today, and working with different groups in Indonesia to provide funds and resources for migrants’ families back home. PL: What are some of the key goals of and strategies for the International Migrants Alliance (IMA) moving forward? EL: All migrants today, regardless of nationality and immigration status (whether they are temporary residents or permanent citizens), face a common problem: their lives are tremendously insecure. Countries that used to be more open are closing their borders and citizens are convinced that their countries don’t have enough resources. This is true whether we are talking about the United States or Australia. While Hong Kong has always had an issue with immigration and borders, we enjoy even fewer protections now, regardless of our immigration status. We have to recognize that the only way to challenge this reality is to organize collectively. I’ve been in the United States recently, attending different forums, and I can see that many of the movements are divided—from those organizing against police brutality to those organizing for better housing. Only occasionally are there united fronts or unified movements. For us in IMA, although we try to organize aggressively on a global scale, our political work has been challenging. For one, there are often not enough resources and, second, our membership is precarious. Even our core members may be deported, arrested, or faced with police violence, and this impacts the stability of our organizing. We are a constituency that continues to be legally unrecognized by the United Nations and other governments. Of course, the United Nations and governments publish many reports about migrants, but they still do not have actual mechanisms to recognize the 250 million migrants and 60 million refugees that exist in the world and bring them into decision-making processes. We are always harassed, attacked, and destabilized. We can’t expect much in terms of in-person organizing; we can’t operate as a regular nongovernmental organization. Even now, we can only meet by Skype and there are not a lot of ways to meet in person. But we do make sure that one thing is consistent: our politics. We continue to take a hard line on migrant and labor issues, as well as globalization, racism, and xenophobia. We also make sure that migrants’ voices are always heard, so that we can identify people in the movement who can represent us in different places. It is also difficult for us to travel. I know I’m under surveillance from the Hong Kong government, my home country’s government, and other regimes. And it is hard for domestic workers to do this type of political work with their busy schedules. But we continue to make sure that we are visible and proactive in our engagement and our solidarity with other labor sectors, groups, and organizations, like farmers, women, and indigenous people. Ultimately, the only way that migrants’ rights will be recognized is if the message comes from migrants themselves. Social media also becomes an important tool for us to stay active and united. We can get creative in our messaging. Last year, IMA was present for our organization’s General Assembly in Mexico, where different migrant leaders presented on their country’s situations. We were also at the World Social Forum and the Global Forum on Migration and Development in Morocco, just to name a couple of international events we recently attended. IMA’s strength is in our members—we are a network of movements and we pay close attention to how the migrants’ movement is developing in different regions. If local grassroots movements of migrants are weakened, then the global movement against neoliberalism will also suffer a blow. Our organization does not focus on getting members to attend everything here and there. Instead, we use key global actions and platforms to declare our message and presence to the public: we are migrants, this is what we want, this is why we want it, and this is what you can do for us. A very simple message. And IMA will continue to fight to make sure migrants are recognized and their voices heard.